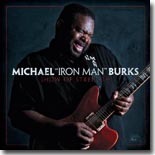 The late Michael Burks left us with one more wonderful CD, Show of Strength, on Alligator Records. It's this month's Pick Hit. This month's Surprise pick features the first album in a long time from The Blasters, and Fun On A Saturday Night is their bluesiest disc yet! We do something a little different for this month's Flashback feature, highlighting a brand new CD, Mercy! that pays tribute to the late harmonica genius William Clarke with new versions of some of his best recordings. It's from Kansas City band Scottyboy Daniel Blues Band. As expected, Mercy! is extra hot! Our What's New section features new releases from Linsey Alexander, Dennis Jones, Albert Cummings, Zac Harmon, Barbara Carr, Johnny Mastro & Mama's Boys, Darren Jay & the Delta Souls, Oli Brown, and more, plus a look at the new autobiography from Buddy Guy.